Almost a year after a massive Equifax data breach affected an estimated 147.9 million consumers, little has changed to help consumers, and personal data like medical records and passport information sell for hundreds of dollars on the black market. 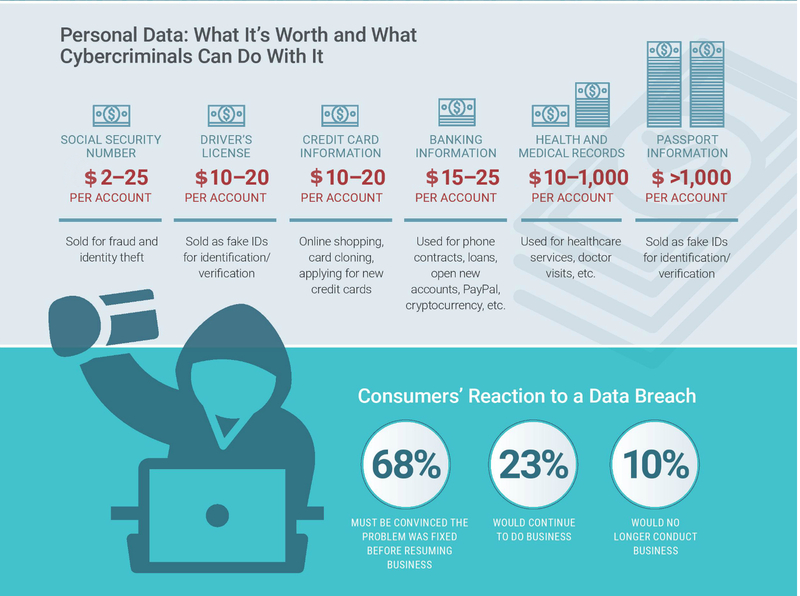 But while more than half of consumers are concerned about hackers selling their Social Security number, that's not the data that fetches the highest cost. In fact, a Social Security number may only net a cyber criminal a mere $2 each, according to Radware. The most lucrative pieces of personal data are health records and passport information. Health and medical records, which sell for up to $1,000, are one-stop shopping for hackers because they contain contact information, a Social Security number and even payment information. Passport info, which can sell for over $1,000, is used to create fake IDs, Radware finds. "It isn't easy to steal personally identifiable information but, as we've seen with past data breaches, criminals who are financially motivated will find a way to capture data for profit," Daniel Smith, head of security research at cybersecurity firm Radware, tells CNBC Make It. Often, hackers will compromise a database containing personal identifiable information and will then take it to an online marketplace or forum where they will post their listings. These "darknet markets," as Smith calls them, typically require vendors to go through just a simple verification process before they are able to post items for sale. "These markets are actually quite similar to a site like Craigslist where anyone can post what they are selling," Smith says. You might think that sensitive personal information like a health record is more well-protected than it is. "Consumers are pretty aware of general fraud and typically understand there are a number of safeguards put in place by financial institutions, like their banks, to protect them," Smith says. "I have a feeling more people assume these safeguards are in place in the medical industry as well." That's not always the case. It can be difficult to monitor your data when it's held by others, such as hospitals and insurance companies. Stay on top of news about data breaches and monitor your credit report and medical benefits and claims for discrepancies. This will help give you early indications, Smith says. "If you think your information might have been exposed as part of a breach, it is best to try to learn how your data might've been leaked," he says, "and then take the necessary steps to monitor for signs of compromise."